While not everyone considers themselves a Weekend Warrior, every homeowner should have certain tools on hand. A small hammer and duct tape are just the basics every person should own, and while a large toolset isn’t necessary, some items are. Keep this guide in mind the next time you head out to the home center or local hardware store. Toolbox: It may seem obvious, but keeping everything in one place will save time when you need an item in a hurry, and keep the box in a dedicated place in your garage or storage closet. Claw Hammer: Every home needs a hammer, preferably with a clawed end to remove nails or for prying hard-to-open objects. Adjustable Wrench:An adjustable wrench takes the place of a wrench set, and, hence the name, can adjust to most average-size bolts. Screwdriver: Most people have two standard screwdrivers: flathead and Phillips. There are screwdrivers that have changeable bits for different sized screws, and they are especially convenient. Pliers: Many types of this versatile tool are available, and the basic design is perfect for all sorts of jobs. You can get specialized styles: needle-nosed, pliers with wire cutters–the choices are endless. Get what you think is best for your needs. Boxcutter/Utility Knife: A folding or disappearing blade would be best for this tool, especially if you have children. It’s a great tool to have for many uses, such as cutting insulation, trimming shingles, as well as repairing drywall. 25-foot Tape Measure: You never know when you’ll need to measure more than a yard-stick’s length, and a 25-foot style is great for measuring rooms, or outdoor projects. Home centers will have an array of pre-filled toolboxes, and if that’s what suits your needs, purchase one of those. 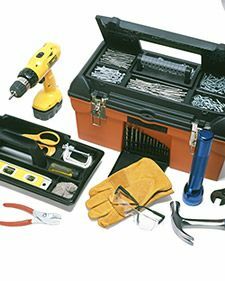 But if you know what you want, assemble a custom tool set to use for all your home projects/minor repairs. Bob Vila provides a list with some extras not listed here, so if you’re a go-getter in the DIY field, see his recommendations for a little more than the basics.